Celebration of the day when young Robin Knox-Johnston completed the first non-stop single-handed circumnavigation. The return of the single-handed around the world Golden Globe Race inspired OCC members to take part in the celebrations of the 50th Anniversary of OCC Honorary Member Sir Robin Knox-Johnston's completion of the original course in SUHAILI. 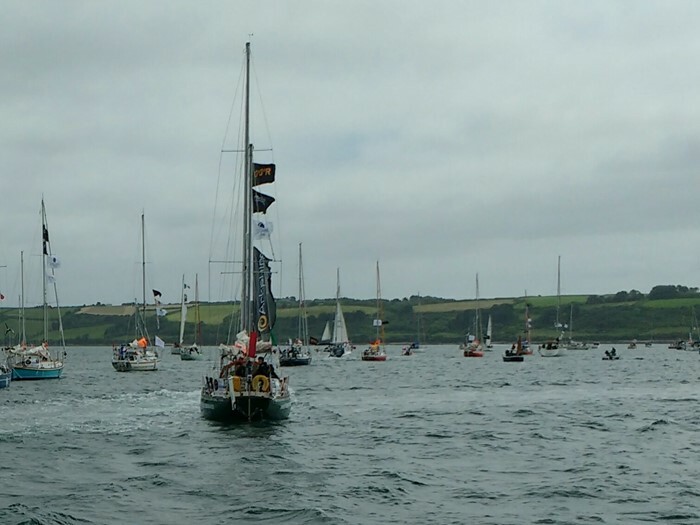 OCC Member Fergus Quinlan reports, "After spending a few days in Restronguet Creek we returned to Falmouth to join the parade of sail. The wind was fresh, thoughts we had for joining the parade under sail were parked after watching an interesting collision. We hoisted a rack of international flags to add colour. Through the melee the participants in the dash to Les Sables d' Olonne began to line up, a Suhaili lookalike steamed past. Gregor McGuckin in his Biscay 36 ketch looked well prepared. We pulled alongside blowing a horn and shouting that we had come from Galway to see him off. A motor sailing Gypsy Moth wove its way through the fleet, we failed to identify any of the 'greats' on board. The fleet finally hovered near St. Mawes where there was a thunderous over flight by RAF typhoons. Pylades turned south, doused it's colours, set its sails and headed for France." Kris Adams reported, "The Golden Globe challengers left Falmouth yesterday to race to France for the start of the race on the 1st of July. We were on the water with them as they set off. Thrilled to be the only Australian support boat out to cheer off Mark Sinclair and Kevin Farebrother from Oz. A wave from Sir Robin Knox-Johnston skippering his famous Suhaili as we left the fleet to return to Falmouth." Read s/v Taipan's account of the events by following the link below. James Fiske commented, "Really quite an event. Royal Cornwall Yacht Club put on a lovely evening for the skippers. A shame it was a bit lively this morning for their departure." JoJo Pickering sent in an #OCCPOSTCARD, "Falmouth, Golden Globe Race 2018 - very exciting!" See all photos in the OCC website photo gallery titled Golden Globe Race & Parade of Sail.